Learn how to use Apache Kafka's mirroring feature to replicate topics to a secondary cluster. Mirroring can be ran as a continuous process, or used intermittently as a method of migrating data from one cluster to another. In this example, mirroring is used to replicate topics between two HDInsight clusters. Both clusters are in an Azure Virtual Network in the same region. Mirroring should not be considered as a means to achieve fault-tolerance. The offset to items within a topic are different between the source and destination clusters, so clients cannot use the two interchangeably. If you are concerned about fault tolerance, you should set replication for the topics within your cluster. 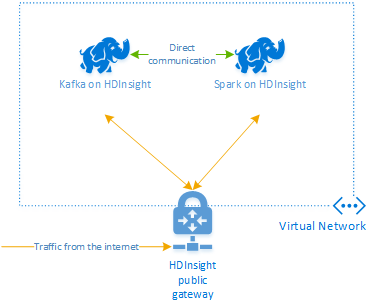 For more information, see Get started with Apache Kafka on HDInsight. The source and destination clusters can be different in the number of nodes and partitions, and offsets within the topics are different also. Mirroring maintains the key value that is used for partitioning, so record order is preserved on a per-key basis. Gateways: The networks must be able to communicate at the TCPIP level. Name resolution: The Kafka clusters in each network must be able to connect to each other by using hostnames. This may require a Domain Name System (DNS) server in each network that is configured to forward requests to the other networks. When creating an Azure Virtual Network, instead of using the automatic DNS provided with the network, you must specify a custom DNS server and the IP address for the server. After the Virtual Network has been created, you must then create an Azure Virtual Machine that uses that IP address, then install and configure DNS software on it. Create and configure the custom DNS server before installing HDInsight into the Virtual Network. There is no additional configuration required for HDInsight to use the DNS server configured for the Virtual Network. 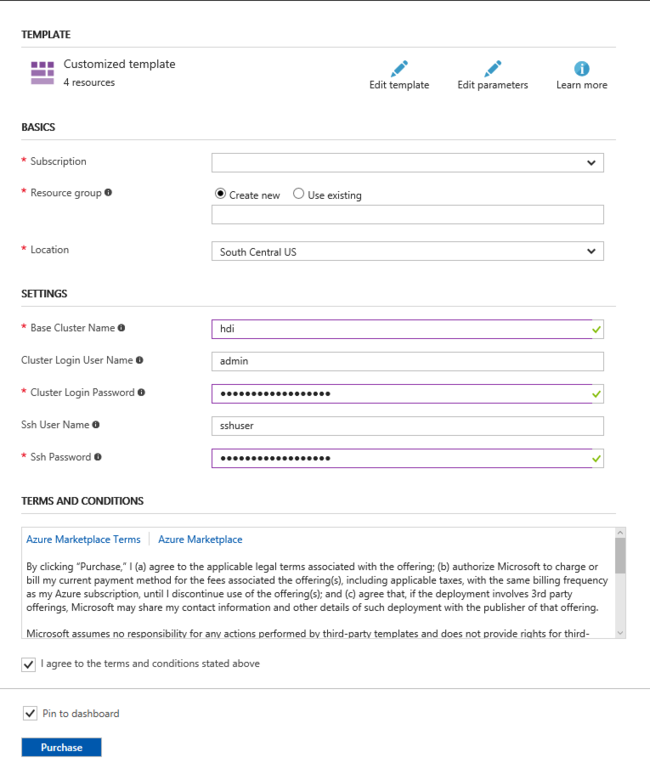 For more information on connecting two Azure Virtual Networks, see Configure a VNet-to-VNet connection. While you can create an Azure virtual network and Kafka clusters manually, it's easier to use an Azure Resource Manager template. Use the following steps to deploy an Azure virtual network and two Kafka clusters to your Azure subscription. The Azure Resource Manager template is located at https://hditutorialdata.blob.core.windows.net/armtemplates/create-linux-based-kafka-mirror-cluster-in-vnet-v2.1.json. To guarantee availability of Kafka on HDInsight, your cluster must contain at least three worker nodes. This template creates a Kafka cluster that contains three worker nodes. Resource group: Create a group or select an existing one. This group contains the HDInsight cluster. Location: Select a location geographically close to you. Base Cluster Name: This value is used as the base name for the Kafka clusters. For example, entering hdi creates clusters named source-hdi and dest-hdi. Cluster Login User Name: The admin user name for the source and destination Kafka clusters. Cluster Login Password: The admin user password for the source and destination Kafka clusters. SSH User Name: The SSH user to create for the source and destination Kafka clusters. SSH Password: The password for the SSH user for the source and destination Kafka clusters. Read the Terms and Conditions, and then select I agree to the terms and conditions stated above. Finally, check Pin to dashboard and then select Purchase. It takes about 20 minutes to create the clusters. The name of the HDInsight clusters are source-BASENAME and dest-BASENAME, where BASENAME is the name you provided to the template. You use these names in later steps when connecting to the clusters. Replace sshuser with the SSH user name used when creating the cluster. Replace BASENAME with the base name used when creating the cluster. For information, see Use SSH with HDInsight. Replace $CLUSTERNAME with the name of the source cluster. When prompted, enter the password for the cluster login (admin) account. Save this information. It is used in the next section. Replace SOURCE_ZKHOSTS with the Zookeeper hosts information from the source cluster. This file describes the consumer information to use when reading from the source Kafka cluster. For more information consumer configuration, see Consumer Configs at kafka.apache.org. To save the file, use Ctrl + X, Y, and then Enter. Replace $CLUSTERNAME with the name of the destination cluster. When prompted, enter the password for the cluster login (admin) account. Replace DEST_BROKERS with the broker information from the previous step. For more information producer configuration, see Producer Configs at kafka.apache.org. Create the topics on the destination cluster: This option also allows you to set the number of partitions and the replication factor. Replace testtopic with the name of the topic to create. Configure the cluster for automatic topic creation: This option allows MirrorMaker to automatically create topics, however it may create them with a different number of partitions or replication factor than the source topic. From the Azure portal, select the destination Kafka cluster. From the cluster overview, select Cluster dashboard. Then select HDInsight cluster dashboard. When prompted, authenticate using the login (admin) credentials for the cluster. Select the Kafka service from the list on the left of the page. Select Configs in the middle of the page. In the Filter field, enter a value of auto.create. This filters the list of properties and displays the auto.create.topics.enable setting. Change the value of auto.create.topics.enable to true, and then select Save. Add a note, and then select Save again. Select the Kafka service, select Restart, and then select Restart all affected. When prompted, select Confirm restart all. --consumer.config: Specifies the file that contains consumer properties. These properties are used to create a consumer that reads from the source Kafka cluster. --producer.config: Specifies the file that contains producer properties. These properties are used to create a producer that writes to the destination Kafka cluster. --whitelist: A list of topics that MirrorMaker replicates from the source cluster to the destination. --num.streams: The number of consumer threads to create. When you arrive at a blank line with a cursor, type in a few text messages. The messages are sent to the topic on the source cluster. When done, use Ctrl + C to end the producer process. The list of topics now includes testtopic, which is created when MirrorMaster mirrors the topic from the source cluster to the destination. The messages retrieved from the topic are the same as entered on the source cluster. Since the steps in this document create both clusters in the same Azure resource group, you can delete the resource group in the Azure portal. Deleting the resource group removes all resources created by following this document, the Azure Virtual Network, and storage account used by the clusters. Apache Kafka MirrorMaker documentation at cwiki.apache.org.